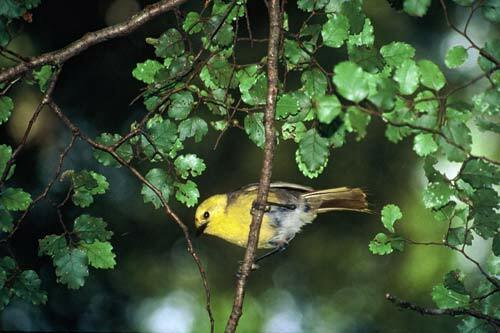 The yellowhead or mohua is a small, insect-eating bird found in South Island beech forests. Their numbers have declined dramatically since the 1970s. Yellowheads are the last link in a chain that begins in years when beech seeds are plentiful. When the seeds are abundant, rats and mice reach plague proportions. In turn, stoats, which eat the rodents, also increase in number. The stoats then prey on yellowheads and their chicks.